‘Thank you very much… The talks were very good. We appreciate them very much.’ – T.A. ‘Dear Brother Shi’an, Amituofo. Thank you so much for sharing these valuable and insightful information about Pure Land Buddhism. Even though I have been learning Buddhism since 2008 but it’s a great shame that I am not progressing much from the the day I was introduced to this beautiful teaching. I attended your lecture in Penang Than Hsiang Temple on 24 Sept 2016 and I really learnt a lot from you. I must admit that I was overwhelmed by so much new yet important lessons about Nianfo, and the way you delivered it was amazingly marvellous. It was both candid and fun to sit through the entire session. ‘I saw a beautiful poster titled “Destination Pureland”. As I am interested to know more about Pure Land practice, I decided to register. I called my sister, thinking it might be a useful course for her and her husband, for learning Nianfo. After attending the course, I found it well covered. We were given lots of beneficial notes. The course is applicable for both Pure Land practitioners and beginner Buddhists. 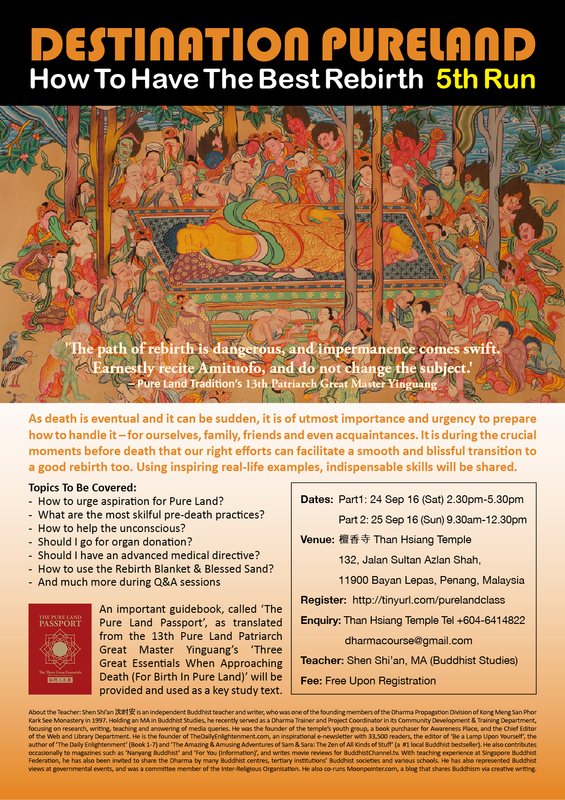 We learnt that life is impermanent and death can strike suddenly, and how we can prepare to handle the dying moments – for ourselves, family, friends, acquaintances and even strangers. I gained a better understanding of accepting death. It is during the crucial moments before death that our right efforts can facilitate a smooth and blissful transition to a good rebirth – the best of which in Amituofo’s (Amitābha Buddha) Pure Land. I now have better understanding of Amituofo and how we can connect to him by Nianfo, and how he can share his blessings with us with his immeasurable compassion and wisdom… The knowledge I gained strengthened my faith in Amituofo. Shen Shi’an (沈时安) is an independent Buddhist teacher, author, researcher, translator, editor and poet. He was one of the founding members of the Dharma Propagation Division of Kong Meng San Phor Kark See Monastery (Bright Hill Temple in Singapore) in 1997. Using retranslated sūtras and treatise texts, he has taught on the Pure Land teachings at Singapore Buddhist Federation, Kong Meng San, Pu Ji Si Buddhist Research Centre and Poh Ming Tse. He also leads the Pureland Practice Fellowship, which he founded in 2008. He was also invited to be a group counsellor for the ‘Theory And Practice Of Pure Land Buddhism’ course at Singapore Buddhist Lodge, and to be its commemorative magazine’s chief editor. He was also invited to teach many Sunday School Dharma teachers on using the true Buddhist teachings to discern controversial ‘Buddhist’ groups.